The New London Chamber Ensemble is a wind quintet with a difference. For over a decade the NLCE has challenged traditional ideas of chamber music with their innovative programmes combining classic repertoire with semi-staged works incorporating drama, speech and action. Concert appearances have taken the NLCE all over the world. Highlights have included performances in northern Sweden, for Courthouse Music, the Banff Festival in Canada, collaborating with pianist Angela Hewitt at the Trasimeno Festival (Perugia) and Wigmore Hall, the Two Moors Festival performing Walton’s Façade with Prunella Scales and Timothy West, collaborating with the Dante Quartet at the Swaledale Festival and Wigmore Hall, The Forge in London with pianist Michael Dussek, Saint-Saëns’ Carnival of the Animals at the Leeds International Concert Season, King’s Place, with composer/pianist Martin Butler, and premieres at the Cheltenham Festival in 2011 and 2014. 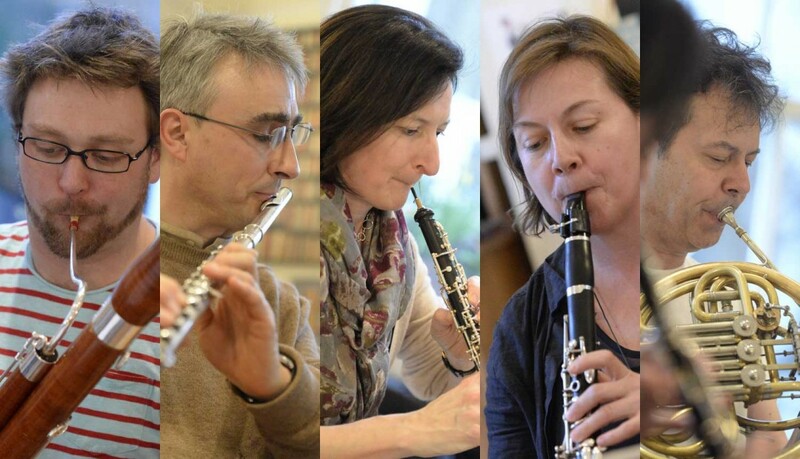 The NLCE is passionately dedicated to new music, and regularly commissions new works; composers have included John Woolrich, Philip Cashian and Martin Butler, as well as arrangements from Julian Philips and Sally Beamish. Their discography includes the wind chamber music John Woolrich, Cabinet of Curiosities (Meridian, 2007) including a new commission written in celebration of John’s 50th birthday; Music for Wind and Piano by Carl Nielsen (Meridian, 2009), voted CD of the year by MusicWeb International, and including the first performance of the Wind Quintet, from the New Carl Nielsen Edition, chamber works by Lennox Berkeley (Naxos, 2010), and ‘Dirty Beasts’ and other chamber works by Martin Butler (NMC 2016). (Click here for more information about these albums). The NLCE is also committed to musical outreach and education. They are ‘Ensemble in Residence’ to the National Youth Chamber Orchestra, and give masterclasses and coaching for music colleges, schools and youth music groups. In 2012 they commissioned a new dectet Settala’s Machine by Philip Cashian, as a side-by-side project to be performed with young musicians; since its premier at the RWCMD in Cardiff, they have performed the dectet with students from the Purcell School of Music, the National Youth Chamber Orchestra, the Royal Academy of Music (Cheltenham Festival, July 2014), Trinity College of Music, and most recently with students at the junior departments of the Royal College and Royal Academy of Music. More recent projects have included the release of their latest CD, of Martin Butler’s chamber music, with a new nonet Rondes d’Automne, recorded with the Navarra Quartet and bassist Leon Bosch for the NMC label, and settings of Roald Dahl’s ‘Dirty Beasts’, recorded with pianist Michael Dussek and narrator Simon Callow. 2017 brought performances for the Hull City of Culture concert series, and the Guildford International Festival. Forthcoming plans include a film of Phil Cashian’s Dectet, to be made in July 2018, in collaboration with the Royal Academy of Music in their newly opened recital hall. Plans are already afoot for celebrations of the NLCE’s 20th birthday in 2020, including a Beethoven project tying in with the Beethoven 250th anniversary year, and the release of another CD, including new commissions of settings of works by children’s authors.